I was faced with a problem this winter. And while in his car seat, my long and chubby 6 month old baby wouldn’t fit under one of these…….. So I decided to make one of these………. Do you want one too?? I bought 1 1/4 yards each of 2 different colored coordinating fleece. I ended up trimming it down a bit but see how you like it once you get it home. You might like it larger or smaller. The bigger you make it, the more you can tuck around your baby once they’re inside the car seat but if there’s TOO much, then it’ll drag on the ground if it’s not tucked in. Decide what will work best for you. Then place right sides together and sew all the way around (5/8 inch seam), except for about 10 inches or so, on one side. Trim your corners and then turn it right side out through the 10 inch hole. Poke your corners out so that they’re nice and square and then fold the 10 inch opening to the inside, 5/8 inch, just like your seam. Pin it closed and then top stitch around the entire thing, 1/2 inch from the edge. Then measure out 2 pieces of wide grosgrain ribbon, that are about 24-26 inches long (depends on how long you like it). 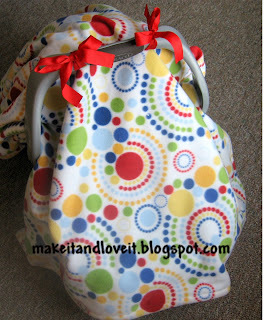 Pin the ribbons to the cover and then place the cover over your carseat to see if the ribbons are in a good spot. Sew the ribbons, down the middle, several times to secure them tightly. Then tie your cover on…………..All Done! And while your baby is in the car or in the store, just flip the blanket up over the car seat handle…….no need to untie it every time. DIY Car Seat Toys...for baby! DIY Car Seat Toys...for baby! A great gift for babies of all ages! This is Brandi used to be Nicholls! Your blog is so cute! I will be following it and I will put your button on my bog! I am excited to make a some new crafts thanks to you! ooohh! GOod Idea! I may have to try this out!! Super cute! And what a fabulous idea! I love it! Thanks for sharing! I totally went to Joann’s yesterday and picked up fabric to make this! I was going there to get other stuff, and on the way there it started to blizzard (Can you use blizzard as a verb?) Anyway, bringing Hunter into the store, I realized how esential this was! ;) Thanks for the simple directions! You should also check out http://www.craftstylish.com/ They have soooo many super cute craft ideas! I bet you would find lots of fun stuff on there too! – to go along w/all your great ideas! :D Happy Sewing!!! Ok, I dont know you, but I found your blog from Delia, Erin and etc(girls from the 52nd ward)… You are SO talented! I love all your stuff!… however, this one totally frustrated me! Yours is simple, easy, quick, and ADORABLE!! The one I made was all fitted and cut to the shape of the carrier and had elastic around the bottom and etc… I liked it ‘cuz when we pulled it down her lap and feet were still covered and we could keep everything tucked in and warm. …sooo not worth the work though! lol…Yours is awesome and Im totally making one tonight! Also, Ive started posting things I make on one of my blogs, so dont worry I will give you credit for the genius and put a link for you! I'm making this. So cute. And I just wanted to remind everyone out there to put your carrier handle DOWN when your baby is in the car. I'm so happy you posted a carseat cover that doesnt interfere with the staps! 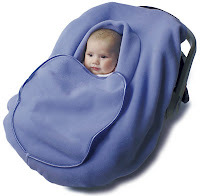 Those stupid 'bundle me' ones make the carseats really unsafe because they go under the baby, but yours is much better because baby can be safe as well as warm. Now just take off those dangerous aftermarket strap covers that are preventing you from tightening your straps up and making the chest clip too low (it needs to be at armpit level), and you will be good to go! I love this because it looks warm AND SAFE! I found your blog on a list of favorite's on Babycenter's group "Crafty Mama's", and I am a big advocate of car seat safety. This is perfect for little one's in an infant seat! I just recently started sewing, and love it! I am planning on making this for a baby shower gift tonight! Thanks so much for being awesome! I can't start to thank you for all your adorable ideas. My sister is Pregnant and I just found out today that I am expecting also. I have been looking every where for a pattern or something, for this very thing. We live in UT and for the past week it has been below 0 degrees. So this is ideal!! THANK YOU so much!! Your craftiness is AMAZING and inspiring. This is perfect! Thank you for posting all of your ideas!! With the cold winter weather this past week, I've had a screaming child everywhere we drive because she doesn't like all the blankets getting in her face. Your ideas are all amazing! These are great! I made one for my sister and found a cute very very soft blanket at the store that was cheaper than buying fabric. So I just attached the ribbons which was tied around the blanket when I bought it. So easy and cute. She loved it!! I know this was an older posting, but I was wondering if you used a snow suit underneath the blanket or if you just wrapped baby in another blanket? I just made one and am due any day now, but wasn't sure if it would be warm enough in the winter. Oops, sorry, my e-mail address is my_cookie_mama@yahoo.com. Can I just say that I LOVE your blog! I am learning how to sew and I love the pictures and tutorials! I like to make things but am not creative enough to come up with ideas of my own! Thanks for sharing! Yeah! I am so excited about this. I have been looking for something like this. Putting a blanket over the canopy doesn’t always work because they fall off or sloop to one side or best is that they aren’t long enough so the wind blows off with it. I will be making one or two of these. thanks. Thank you for this wonderful idea! I received one of the fitted covers but it didn’t “fit” and my baby is tall as well, so I will be making one of these for him! Thank you so much for this tut.I was going to pay like $30 for a already made one for my grandaughter and then was going to buy one for my new baby.I am so glad I can go and spend less than $20 for material and make it myself. Yay. Made this in like an hour and a half. It is wonderous. And I dont even get to use it. Its for my neighbors brand new baby girl. Humph. I know this is an older post but I just found your pattern and I’m excited to start making it! We also live in Idaho and with the smoke and wind, I need something to cover my 6 week old right now but also need something for the winter. I was wondering the same thing as Cookie Mama. I’m assuming in Idaho you have the baby bundled in a snowsuit and not just a blanket. But if you could let me know, I would appreciate it. Thank you! Quality articles is the main to be a focus for the visitors to go to see the web page, that’s what this site is providing.